If you want a new smile and don’t like the idea of wearing braces, then Invisalign® or Invisalign Teen® may be the right choice for you. It is a great treatment option for both teens and adults, and can fix many common dental problems. Commonly referred to as “Invisible Braces,” Invisalign is a series of clear, custom designed aligners, similar to a very thin mouth guard that progressively straightens your teeth. Usually, no braces or wires are needed. This gives you the flexibility to keep a relatively normal appearance but be achieving a better smile at the same time. The best of both worlds! Invisalign Teen is designed specifically for adolescents and is becoming a very popular option with our teenage patients. It is created with teens in mind and has many built-in options and features that cater to their unique dental conditions and lifestyles. The aligners are made out of BPA-free plastic that is extremely smooth and won’t rub or irritate your tongue and cheeks like traditional braces may. For best results, aligners are meant to be worn 20-22 hours per day and only be removed for eating/drinking and oral hygiene. On average, aligners are switched out for a new set every 2 weeks that are a slightly different shape, which is closer to your end result. About every 6 to 8 weeks we will see you back in the office to check your progress and ensure your teeth are moving correctly. There are 5 Main Reasons to Choose Invisalign over Traditional Braces. We’ll unpack these a little more below, but the most important thing to understand about invisalign is that it allows you to continue to live your life with minimal interruptions. Because Invisalign aligners are removable, you can take them out and brush and floss your teeth like normal. This allows most patients to maintain the same, or better, level of oral hygiene. As the teeth begin to straighten out, brushing and flossing will become far easier too. Additionally, the forces that we use with Invisalign are usually less than with traditional braces and therefore your teeth don’t get as sore. Unlike braces, there aren’t any food restrictions with Invisalign either so you can eat whatever you want! And no dealing with loose braces, poking wires, and other annoying emergencies. Invisalign works by replicating your teeth into a 3D software program that lets the Orthodontist prescribe movements to gently and comfortably guide your teeth into the correct positions to give you an amazing smile. By utilizing this technology, we then create, deliver and progress through a series clear aligners that produce the desired result. While Invisalign is the best-known form of invisible braces, it’s not the only one. 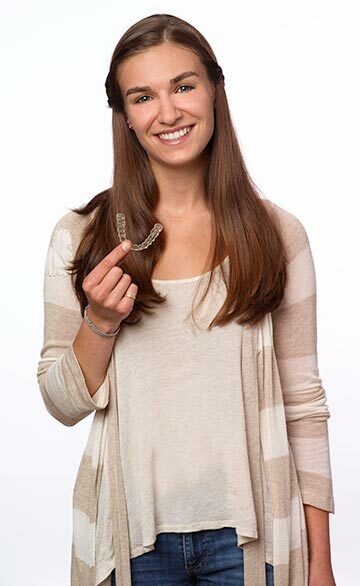 Invisalign is a brand name — and there are other manufacturers who make clear aligners as well. Each company has its individual strengths and some of our patients prefer to get their aligners from these other providers. Talk to Dr. Paul about the right choice for your child. Accelerated orthodontics using Invisalign and other clear braces aims to reduce the amount of time a patient must be in orthodontic treatment. Kids are eager to get this phase of their dental development over with quickly, and the idea behind accelerated orthodontics is to give them what they want. • Micropulses: Patients softly bite on a gentle vibration-producing device for as little as 5 minutes. The pulses can speed up tooth movement, shorting the overall time needing to wear Invisalign or braces. Some patients also report a reduction in discomfort as the teeth move. Bonus! 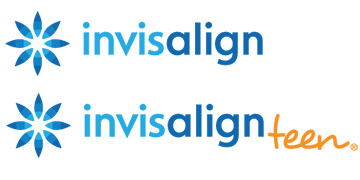 • Invisalign Express: For some mild to moderate treatments, Invisalign Express offers a great option to reduce treatment time. We are able to minimize the number of aligners needed to produce a great result. • Limited Braces: Braces can be used to focus on straightening the front teeth only, so it’s suitable largely for patients whose misalignments are in the upper or lower front teeth. We are also able to apply braces onto the teeth on one jaw exclusively. By focusing only on the teeth in one jaw, we are able to limit the overall time in treatment.